There have been a series of books recently on my reading list that impinge territory covered by The Power of Habit and they all reinforce one another. Perhaps that indicates I only read books that bolster my own thinking or that I am obsessed with a narrow field of thought. Or maybe it is just a habit. We are all slaves to our habits. Or you could say habits free us to do really important stuff. Habits operate from our subconscious mind meaning we don't think about them nearly as much as we just live them. The beauty of the human brain is that we do most of what we do on auto-pilot, but are amazingly unaware of that. The sub conscious allows us to survive. We are able to interpret and react to many details without really being aware of them. Our mind can automate much of what we have to do. The basic concept of a habit is something we do without conscious thinking after we are presented with a cue and before we get an anticipated reward. To really entrench a habit there is usually a craving for the activity. We are not conscious of most of our habits. We have countless habits that take up much of our day. Although we can't identify many of our own habits other people can. One example given has to do with hit music and how to manipulate our tastes. Another example comes from Target, a major retail chain who wanted to determine prospective customers who were pregnant. They used a huge data base to discover buying habits of pregnant women and refined it so they could get an early read which would allow them to direct more buyers into their stores. This was was so sophisticated that sometimes the women (or their families) were unaware of the pregnancy. The author provides two case studies of social movements tying themselves to habits to grow. One is Rosa Parks who refused to give up her bus seat in Montgomery which led to a dramatic upswing in the civil rights movement. Another is the Saddleback Church that grew to a very wide membership. We are all conscious that we have bad habits that hurt us and would like an easy way to change them. Essentially that is my motive for reading the book. Unfortunately bad habits are just as automatic as our good habits. 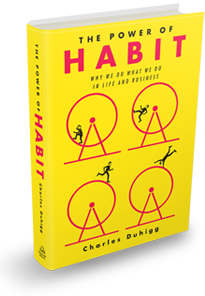 Charles Duhigg maintains you cannot break a habit, only replace it with something stronger. The first step is to identify the routine needing to be replaced and then experiment with rewards to determine what is the motivation. Then you have to isolate the cue. Five cues are suggested: location, time, emotional state, other people, and immediately preceding action. Record and study the possibilities and then develop a plan. Although it is much easier said than done this is an effective method to replace any habit. Aristotle is quoted to good effect, "just as a piece of land is to be prepared beforehand if it is to nourish the seed, so the mind of the pupil has to be prepared in its habits if it is to enjoy and dislike the right things." Free will occurs when you are consciously able to alter your habits. Or when you rise above your habits and use your conscious mind to make better decisions. For about two decades I could be described as a traveling salesman. Mostly calling on pet store retailers, feed stores, tack shops, veterinarians and health food stores. It was a tough slog, but I did learn a lot and had many enjoyable experiences. Those of you stuck at a desk or even at one location miss a lot. I know because I am now mostly stuck at a desk. I started selling for a start up company on a local basis and then succeeded in developing retailers and then wholesalers that extended our reach throughout most of Ontario. That was a great opportunity, but certainly a challenge. In order to keep the wholesaler happy we had to persuade retailers further and further away. Later I signed up wholesalers in Quebec and the Maritimes, but that's for another post. I would drive into a town or city, make as many targeted visits (usually less than 5 minutes each) as possible in a short time and only superficially got to appreciate where I was. I did learn my way around and between a lot of Ontario towns. I was a real fanatic for not wasting time aiming to make my first call at 8:00 and occasionally could find those open even earlier. Contacts would be followed up by phone and another visit. Driving through the countryside was enjoyable, especially in sight of water (rivers and lakes in Ontario and oceans elsewhere). Often I would be cruising around the speed limit and perhaps focusing a bit on my next call, but in the rural areas the feeling was very different. There is something awesome in nature. Perhaps I am kidding myself that speeding along asphalt and concrete with signs of civilization not hard to find brings you back to nature. Nonetheless it is enjoyable in a way hard to describe. Normally I enjoyed watching farm animals, but once I got closer than intended. Taking a short cut near Pembroke I came across a herd of cows that clogged up the road. I learned, that despite their fearful size they are very anxious to get out of your way, but are a bit slow to figure out the fastest way to do that. I would gladly visit many of these places again with half an excuse. Trying to sort through all my favorites it could vary, but I will declare right now my favorite place in Ontario would be Picton (Prince Edward County in general). Just a quaint little town on the water with nice people. Once I visited it without any intention. I was in Kingston and took a route not knowing where it ended up. An unexpected ferry boat took me to Picton. The fact that the county has developed a reputation for wineries only enhances my interest. Downtowns are different so they inspire another sort of respect. Old architecture, innovative design. Bigger cities that I liked included London and Kingston, both university towns with minimal industry. Ottawa is a beautiful city, I can remember seeing skaters on the Rideau Canal. Actually Toronto does have some pleasant stretches--Mount Pleasant really is pleasant and Bayview beside the Don Valley is also very nice, especially if you think of Toronto as mostly skyscrapers and homes. I remember TVO had a program about the best main streets in Ontario and one of the winners was the Beaches along Queen St. and I tended to think it was a unique place. Don't mean to neglect my home base of Hamilton. Most of the time I just drive to and from work and don't really see everything, except I get to go by Dundurn Castle and Cootes Paradise several times a week. Hamilton now includes a much larger, mostly rural area. Although many people make fun of the Mountain, it does make Hamilton unique and gives a beautiful view. All along the Great Lakes are many scenic nice places where the residents are happy with their choice. A few places I would name include Goderich, Kincardine, Owen Sound, Meaford, Midland, Port Stanley, Port Dover, Amherstburg, and Port Hope. Places not so much on one of the Great Lakes that I enjoyed visiting included Hanover, St. Mary's, Perth and Ayr. There are too many places to name. Some places are special. I remember trips to drop off orders to a wholesaler in Wellesley. I knew they were famous for apple butter and one time I approached a local store who was out. He directed me to the head office a few hundred yards away. There I discovered a new product, called pumpkin butter not available in stores and it became one of my favorite condiments that I bought every chance I got. The Hills of Caledon just north of Brampton seemed to be on the road for a lot of my trips. I got so I liked driving up and down the hills. Especially with the fall colours. Highway 10 or Heart Lake Road. Up north New Liskeard got my fancy. Part of the fascination was the water. A very pleasant drive was the road between New Liskeard and Haileybury beside Lake Timiskaming. A family friend spent time in that area and recalled that drive as well. On another occasion I approached it from the Quebec side and got a lovely view from the other side of Lake Temiskaming in the early morning. Sudbury is known as the Rock. I dragged my wife and kids for a mini vacation where we visited Science North and the Big Nickel. After one sales trip to Sudbury I met two vet technicians at a trade show who knew about my visit, because they had heard about it, although I missed both of them. My best hotel value--$26 well heated and a good size was in Gogama which is about half way between Sudbury and Timmins. When I look back on it the key thing was the people. Some were chatty, friendly and helpful, but others couldn't get rid me fast enough. One customer liked to say he didn't like to buy except from people he could get close enough to to punch in the face. Usually in Toronto store owners are over whelmed with salesmen touting "the best" whatever. The most severe rejection I ever received ended up becoming a customer through a colleague that was more approachable. Everyone is unique, but at the same time we have something in common with everyone. Every salesman learns that, but I have been fortunate to enjoy a wider diversity because I went to big cities, small cities, towns and rural areas in distinctive different regions. There is a different culture in each segment and also some diversity in each segment, but they also have a common core. I enjoyed reading about the places I visited. Enjoyed some radio programs and learned of stations at different locations CBC and NPR were stations I listened to. Listened to music tapes, sometimes to put me in a mood of appreciation, for instance on the long drive to Timmins, made sure I listened to Shania Twain. The challenge to earn a living also gave me the opportunity to learn about the province I live in. The more you understand the better service you can offer. I wish that digital cameras had been more affordable earlier. The following photos are a small sampling of what I enjoyed on my more recent travels. wall mural in Midland Ontario, one of many which I think is a great way to beautify a town. mockup of water mill in Orangeville, I am not sure how functional it might have been, but very impressive. mural in Welland, Ontario. This is a town with a very wide selection of murals. When my son, Michael recently moved to New Zealand to try his luck at getting a job this book got my attention. In some ways it is one of the more profound books I have read. Profound might be interpreted to mean they supplied me with notions that support my already established beliefs. Perhaps so, but not enough people have really thought out the issues of fairness and freedom. New Zealand and United States are both open societies with much in common. The American author uses a comparative study of the two to analyze what he sees as a significant difference. 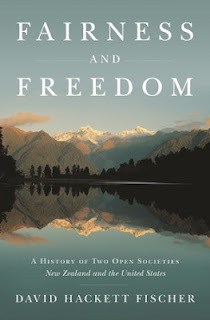 In United States freedom is the underlying philosophy, while in New Zealand it is fairness. Fairness sounds namby pamby to those who feel individual freedoms are the highest value of all, but freedom, not really understood can be perceived as selfish and short sighted. Your freedom should end somewhere away from my nose and vice versa, but freedom lovers don't always appreciate that aspect of it. Each concept has its faults, after all human nature is not conducive to restraints of any kind. Envy, resentment, vengefulness, pride, fear and above all selfishness are normal human traits. Harnessing those traits is a hard task if one wants to optimize civilization. They were both English speaking colonies. The United States gained its independence after a bloody war whereas New Zealand took a longer more legislative transition. Americans fought the original inhabitants, known as Indians and pretty much subdued them. The New Zealanders fought the Maoris who were more united, at least in language. The Maoris managed to find a more decisive role in their society. Land seemed endless in America, whereas there was a definite limit to New Zealand. Land reform helped to stabilize affairs in New Zealand in 1891. There was a much higher percentage of owner occupied land in New Zealand. New Zealand abolished provinces in 1876 whereas United States is really a union of states with federal oversight. From the beginning Americans felt the need for personal liberty, although they justified slavery. Over time the New Zealanders developed a concern for fairness although they abused the Maoris. In 1920 New Zealand put restrictions on gun ownership. Americans are very vocal about their gun rights under the Second Amendment. Violent crime and imprisonment are much more common in America. In 1893 New Zealand became the first nation to enfranchise women. Women were better represented in the New Zealand Parliament than in most of the world. In 1936 New Zealand was the first nation to broadcast Parliament. United States adopted an electoral college in order to assure the smaller states they would have disproportionate influence, but often distorts what the majority of Americans actually want. New Zealand adopted a proportionate voting system that many people (including myself) believe is more fair and better reflects what New Zealanders want. After World War II, New Zealand fought against the United Nations Security Council having vetoes wishing to give more power to the General Assembly. They always seem to fight for peaceful negotiations. Ronald Reagan was infuriated with their refusal to accept nuclear battleships on their ports. After a lot of historical details of both nations the author summarized his thoughts on the two title traits. Freedom can be interpreted in many ways, but essentially refers to no or minimal restrictions on what a person can do. In reality one person's unrestricted freedom runs up against another person's freedom. One of the best examples deals with slavery. Slave owners were adamant that they had the right to own other humans whose freedom obviously meant nothing. Any law is a restriction on someone's freedom, but is often to protect others. Tea baggers seem to resent taxes, and claim that the American Revolution was fought against taxation. In fact the actual Revolutionaries were against taxation without representation. After the Revolution taxes were increased as it was realized money was needed to maintain a free and strong republic. Fairness is a restraint on freedom. One person's unlimited freedom has to cut into the freedom of another. How do we determine what is free and fair? The author has a good perspective well worth examining. Rich people in the United States sometimes are heard to say that poor people are just envious of successful people. In New Zealand and other countries envy has been a problem. Equal opportunities do not lead to the same outcomes. There is envy that some people with talent or who work harder achieve more. There are many people who feel entitled, some because of wealth and others because they want to receive more than they give. Fairness would include people rising to the top of their talent and effort. Democracy and freedom come with responsibility. Part of the responsibility is to vote and not claim ignorance or claim choices are fraudulent. Americans actually have a very low voting record and yet one party seems to think there are too many people voting. Part of the responsibility is to recognize no one got their level of success without support from a wider community. The next generation deserves as much support as our generation was given. By the way my son did get a job teaching and seems very pleased with living in Auckland. My father, for many people was not an easy person to like. For those who know him mainly through me it might have been even harder. Like many sons I felt my father was the one who imposed restrictions on my freedom. He could be loud and abusive. Sometimes he seemed to be close minded. Looking back he seems socially awkward, but well intentioned and did a lot of interesting things. He was very introspective. He revealed his conscience when he said several times it wasn't just important what you agreed upon with another person, but what they understood. His actions revealed his belief in this. The personal criticism that hurts me the most is when accused of being just like my father. Usually said when I am doing something that I recognize is not constructive. It hurts doubly because there is often an element of truth to it. I am like my father in ways that have held me back, but I would also like to think in a few commendable ways, ways that are not always appreciated by others. When dealing with anyone outside his comfort zone he was usually very quiet, but at some point he was apt to say something blunt and offensive. There are two sides to that. He wouldn't flatter people or try to mislead them. I worked for a few years at a newspaper circulation department and felt in line to get a promotion that opened up. In my mind I was the most logical person for that position, but the company brought in an outsider. We rubbed each other the wrong way, but the real problem at my end was resentment. Still after awhile I came to admire the outsider. He was not afraid of hard work and he tried to be fair. I learned afterwards he wanted to fire me, but decided to phone one of my references who talked him out of it. Ironically in the end he was forced out of the company while trying to make things better. When he came to say his goodbyes to our office I told him that I really appreciated his work. He politely dismissed my words, but was interrupted by our secretary who assured him I didn't say anything if I didn't mean it. This stunned me, but afterwards I realized it was something I picked up from my father. Diplomacy is not always my strong point. My father was an only child who was born after hope had been given up. His parents, after a long courtship had married relatively late. After a miscarriage six years before, he was born when his mother was 44. I had heard from others that he was spoiled, but growing up I heard more about how rough things were (during the Depression). I think in some ways it was hard to live with older parents, but I am sure their life revolved around him. Instead of being the only one, I was the oldest of six and only about 21 years younger than either of my parents. My father was a man of accomplishment, mostly to do with motor vehicles. The year before I was born he won a national title for motorcycle trials. He had taken my mother on a motorcycle honeymoon. I have seen trophies for boat races and flying airplanes. He picked up an interest in car rallies when I was about 10 or 11 and was persuaded to enter the biggest car rally in the country- the Canadian Winter Rally in 1960. The day he won on his first attempt was doubly memorable as my sister Rebecca was born, February 14th (oh and also Valentine's Day). I remember my dad's name being mentioned on the radio, but when he came home I remember the only topic was my mother and his new child. Our family car was featured on the back page of a glossy car magazine which was unusual, because instead of a flashy car it was only a Riley 4.64. The European champion from Sweden was also in that event, but as luck would have it he ran into storm problems which as a new entry my father avoided. To prove it wasn't a fluke he entered the event the next year with a different navigator and won first in his class. Despite offers from car manufacturers (Saab was one) he gave up car rallying to concentrate on his business. Another accomplishment I heard plenty of was that in high school he could type 80 words a minute on a manual typewriter. I never got above about 40 words per minute. He was a truck driver by choice. At one stage he had taken over a coal retail business from his father, but that was probably doomed by the 1950's. He enjoyed driving the big trucks the most, but for awhile delivered for a drug store in a van and later became a bus driver. Finally he put together enough to buy a truck and eventually two and three additional ones, hiring drivers he had met at the bus company. At his funeral one of them cried. He was defensive about being a trucker. He had unusual talent as he was well respected not only for the highway driving, but also for the yard work where you are asked to maneuver to get into loading or unloading position. He had been asked to be on a dump truck operator association as director. At that time I worked for a newspaper that was doing a series of critical articles about truck drivers which reached my father's attention. As my father said, "if you got it, a truck brought it." When driving I try to give truck drivers room as I do appreciate they do have a difficult job that is important. As a youngster my father was "forced" to take piano lessons. He reported that he hated them, but apparently did it for a number of years. When I was a young boy someone persuaded him to buy a Hammond organ. He took a few lessons, but he wasn't able to continue as he was a truck driver who a lot of the year worked 14 hours a day. But he was constantly playing on it. He liked to listen to big band music, a lot of jazzy organ and surprisingly listened to church organ, although he was not religious. My mother also played. A pleasant surprise was my sister Rebecca took an interest. My father encouraged her every way he could. 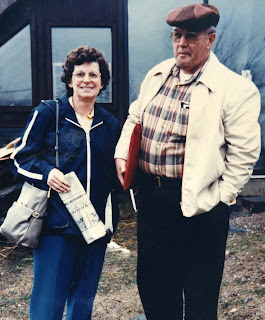 When she reached a level that required advanced instruction he would drive her from Haliburton to Peterborough every Saturday about an hour and half each way. She eventually got a music degree from Sir Wilfrid Laurier University. By request I inherited his vinyl record collection, but until recently I could only listen to CD and cassettes, but as I write this I am enjoying listening to some of his favourite LPs. I had asked him for them long before he died. When I was a newspaper carrier I received a complaint from someone that I was late delivering their paper. My father took quite an interest in the problem and quickly determined that I was walking much too far. He got in his car and measured the length of different streets, took a close look at my list of customers and worked out a much shorter walk that allowed me to satisfy my customers and get home sooner. Another interest of my father was photography to the extent that he had a dark room (a term not used very much these days). Among other things he took a lot of photos of the Oshawa Truckmen who became the Whitby Dunlops after a fire burned down the local arena. I was taken to many games. As the Dunlops they won the World Championships in Oslo, Norway. He also took a lot of photos of his children, but as with a lot of parents that started to fade about the time of his third child. He did pass on his love and some expertise to my brother Marshall who has been generous in sharing. I learned from many others that my father was considered an exceptional driver, after all he made his living driving trucks and had won all sorts of awards. Well he was pretty much a dud teaching me to drive. I never did learn to drive with a shift and eventually got my license through a driver education program. Many years later I had to pick him up somewhere and drive a distance. He surprised me by saying I drove much better than he had thought I ever would. I should add that my father was the only driver that I felt comfortable falling asleep with on the road. Car racing was another interest. As a youngster I had attended stock car races in Toronto and motor sports at Mosport. A little rolled over to me as I found myself following Grand Prix races. He loved dogs and we always had a dog that I can remember. In many ways he related to his dogs much better than with people. He once said if you wanted a dog to love you, you had to let it sleep in your bed. My mother got used to it (after all she had six children). I also had the family dog sleep in my bed as did most of my siblings. I once had the idea that he didn't like cats, but my sister Susan, proved me wrong by picking up two strays. From time to time some person bent on religious conversion would talk to my father (who later worked with Jehovah's Witnesses) and he would always ask if he would meet his dogs in heaven. He wasn't impressed with anyone who said no. One of the things I did with my parents was watch movies. They used to take the first three of us to drive in movies. At some stage I was allowed to stay up for the late show on tv and I remember a lot of films we enjoyed together with stars like Alan Ladd, James Cagney, Bing Crosby, Errol Flynn. My father said he didn't enjoy movies where there weren't enough women to go around as he didn't like anyone to lose out. I watched some of the old favorites with my son, Michael. As a youngster in some ways I was the envy of the neighborhood kids because my father would make and maintain an outdoor ice rink on our lawn and encourage me and neighbouhood friends to play hockey. I was never encouraged to play organized hockey, but Hockey Night in Canada was avidly watched. When I was just finishing grade 11 in Oshawa and feeling life was going my way he decided he had had enough of city life and wanted to move to a rural area. I was very resentful and confess at this time I thought Oshawa was the centre of the world. There was an adjustment for sure, but I got a much different perspective on life living in Haliburton. Since then I have felt more comfortable in dealing with people in small towns and rural areas who have been a big part of my sales career. When my daughter, Heather wanted to attend school in Halifax I thought it good that she expand her mind beyond her Hamilton base. I was not very mechanical, but I was relatively athletic. Although I never received the type of coaching that my son later would I embarked on my own training program including buying some weights. My father never commented on my efforts or results (I was able to do very well on a local level), but I overheard him telling my younger siblings they should be more like me. That was his style, unfortunately. He would criticize you to your face telling you it was for your own good, but very seldom gave any praise. Once when I won an essay contest (covering three counties) he said that was good, but he probably wouldn't agree with what I had written. After graduating from university and thinking I was pretty hot stuff it took me 6 months to get a job, most of which time I was at home. Finally I got a job and it required a car. My father offered to arrange it, but preferred I get a pickup truck as it would be more useful if the job didn't work out. I had been told that I would need a back seat from time to time so that idea was stopped in its tracks. He took me to a trusted dealer (Bill Drew in Ajax), test drove the car (he could have made a living doing that) and told me what was wrong with it (all minor faults), and got me started on the paper work and took care of the downpayment. He had also arranged for me to have car insurance. As it turned out, the job lasted only 6 months whereupon I got a good lesson in economics. The car was not worth what I owed on it despite 6 months of payments. It took another six months before I got another job and my father helped with the payments as he explained I could lose my credit standing. I remember visiting home after university and a common routine would be not much conversation until it was near time to leave. My father was actually a very intelligent, open minded person who just found it hard to warm up. After settling down and getting myself engaged I learned I would be expected to make a speech in front of over 200 people. Enough to make one change their mind, but really I was committed. Many years before my father had taken a Dale Carnegie course and had been very impressed by it. I secretly thought that it had not taken hold very well. He had made an offer if any of us kids were willing to take the course he would pay for it. I figured it couldn't be something I would want, but my new challenge made me think again. I took him up on the offer which he honoured without any hesitation. I am glad I took the course, because like my dad it didn't make me a perfect person, but it certainly made me a better person. When my sister Rebecca married Ali and moved to Montreal while Ali was outside the country (getting paperwork to come back to Canada from Morocco) it was my father who tried to organize the rest of us to visit. He made it easy by offering to do the driving. Rebecca was pretty much by herself, not even at first speaking much French. I was one that never made it. When we learned that my mother was dying I heard of a conversation she had with my father. They had planned to travel a lot, I think specifically with an RV or truck and trailer. She said she wasn't going to be part of that. Combined with her need to be hooked up to an oxygen tank my father bought an RV and took her to visit old friends and relatives. He accepted that she was dying and tried to make her life as comfortable as he could. All of his children were kept informed.. I should mention that after my mother died he married three more wives within a decade. My mother had spoiled him by helping with his business, raising his children and taking a lot of verbal abuse. Others weren't so tolerant. My father moved a few more times in his life including Kitchener and Elliot Lake. His last home was Trenton. All his life my father struggled with weight trying all sorts of diets and bought an exercycle machine. The real problem I saw was he was a very frustrated man (who worked very hard and was smart) but couldn't find enough satisfaction with life and so ate a lot of comfort food. I picked up that as well, although my weight was not quite as bad. When he died part of the problem was that because of his obesity (which had gotten worse as he aged) doctors couldn't diagnose the problem until it was too late. For the last 48 hours or so of his life he was hooked up so he couldn't speak. At my father's funeral I learned a lot. Rebecca gave a very long eulogy. She was not blind to his faults, but tried to help us understand him better. Despite his accomplishments he had an inferiority complex--as my sister pointed out he felt uncomfortable unless he was the best in the room. She gave an example of how proud he was to have me as a son. She also reminded me of one characteristic we shared and that was we both liked to move around--he as a truck driver, me as a traveling salesman. I was also caught off guard with what he had done for an old friend, Max. Max had lung problems, similar to my mother, but was able to get a transplant. My dad drove him back and forth (from Oshawa to Toronto) for treatments after my mother had died. I could have written more stuff, but really for good or bad I am an awful lot like my father, only I have people around me that make me a slightly better person than I would be on my own. Photo is of my dad with his better half (literally), my mother. Taken by Miriam Barnes. There is nothing that persuades so much as trust. We all get caught up in the idea of networking and talking to as many suitable prospects as possible, but trust can be a short cut. People will talk about you and it can be beneficial or harmful. In a sense we are all selling something maybe in exchange for money or maybe to persuade another person to believe what we are saying. Quite awhile back I read The Speed of Trust and it got me to thinking. I was also conscious of Milton Friedman, a hard nosed economist who once said that the thing that would most boost business is more trust. What is trust? It boils down to this: do people believe you will do what you say and are you telling the truth? Do you respect their interests and viewpoint? Will you do the right thing? If trust is low there will be reluctance to buy from you or even to accept your word even if your offer is as good as you claim. Obviously trust is not instantaneous and takes time to develop. When we are seriously thinking of buying something a process of evaluating goes on. Can we really afford it? What will we have to give up to enjoy this new thing? At bottom is the question, is this really as good as it seems? Does the sales person have short term motives for what they are saying? As a sales person on your first contact with a prospect it is difficult to develop real trust, but the process can start right away. If you can say something such as "I will only take two minutes of your time;" and stick to it that is a start. If at the end of your talk you say something like I will call you back in one week or I will call you back with the answer and actually do it you are a little further down the road when you are able to keep your promise. Doing what you said you would do still surprises many people. Experience has taught people to be very suspicious of your motives and your integrity. To respect someone's viewpoint you have to understand it better. Making assumptions is dangerous. As someone makes a wrong assumption about you, it is natural to question if they really have your interests at heart. If you really care what concerns other people you will naturally listen. If you don't really care, but only want what you can get out of them it will be hard to hide. Do yourself justice and actually listen to the concerns of those you hope to either do business with or relate to socially. You will better understand what you need to understand before going forward. You are on display all the time. You might think nobody is watching, or at least nobody who counts is watching. First you should never dismiss the value of anyone. Second you need to be consistent. Third you are always there. If you do not live what you believe there is an imbalance that others can detect. One way to judge someone's character is to see how they treat people that can neither help nor hurt them. The concept of networking is very popular. All too many times it is assumed that exchanging business cards and letting others know what you sell is the basis of building business. The basis really is, are you trustworthy. One really key element is do you really care about the other person. What they are interested in may seem off beat to you, but you can learn something and sooner or later you will learn that your interests do intersect at some point. One of the values of networking is not that the person you are talking will do business with you right away, but that at some point down the road they may remember you when a friend of theirs asks for advice. A good way of looking at it might be who do you trust. When a stranger phones you and tells you about a tremendous bargain with no risk, do you engage right away or maybe investigate or maybe hang up the phone? When your neighbour of ten years tells you about a new restaurant do you perk up or do you forget about it? When your closest friend since elementary grades tells you something unknown about anything of interest do you believe them? As with most salespeople I cannot make a living just because I make one sale. Repeats and referrals are the backbone of selling. Of course there are people who make enough on one sale and move on quickly that they can make a living, but they constantly need to outrun their reputation. Your trustworthy reputation will spread, perhaps more gradually than your quick deal competitor's. Eventually your trustworthy reputation will precede you and develop some momentum as long as you work to maintain it.